How to make a fabric doorstop? Step 1: Draw out your template on tracing paper (it is a t/ cross shape) or direct onto the material with tailors chalk. I use a 2.5cm seam allowance. So the total width is 45cm x 40cm height. I use the offcut of fabric to make a handle. The fabric for the handle is 5.5cm x 15cm. Step 2: Cut out the doorstop and the fabric. I then take the time to iron/press all the seams, this makes it easier to match them up. Step 3: Make the handle. This needs to be 3.5cm wide, once made. Sew the 2 pieces of fabric (5.5cm x 15cm) together, right sides together, with a 1 cm seam allowance. Your parallel rows of stitches will be 3.5cm apart. 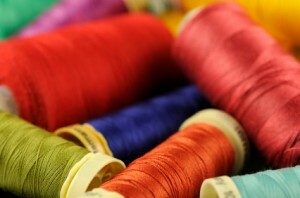 DO NOT SEW THE NARROW ENDS. Turn inside out, press. Step 4: Sew the bottom of the doorstop first. With right sides together, sew in the zip (you don’t actually have to have a zip, but as rice is perishable (after quite a few years) you might want the ease of being able to get it out quickly). It is tricky to line up everything correctly, so do take your time. Only sew the zip for 10cms (the length of the bottom of the doorstop), for ease of cutting etc. Just stitch to the fabric inside the seam lines. (I hope this makes sense). Now sew the other side and match up a side at at time (working inside out, with the right sides together) to form the rectangular box shape, working from the bottom (where the zip is) upwards. Step 5: Before you sew up the top, you’ll want to insert the handle. I attach the handle to the top of the material, it should be placed against the right side of the material. Pin in place. Do measure this, to put it in the middle. It should be 3.25cm away from each side. (Remember to ignore the seam, to get the accurate place). Do give a bit of give in the handle, just enough so you can pick it up with your hand. Step 6: OPEN THE ZIP (so you can turn it inside out). Sew the top sides together, I tend to sew the handle a few times, to make sure it’s well in place. Step 8: Insert a plastic “freezer/ sandwich” bag into the doorstop. Fill the plastic bag with rice/ beans. Step 9: Put by your door! We have found these instructions on http://clairesmakeanddo.blogspot.com. I love your blog, what WordPress theme do you use? Thank you for your comment. We use a theme called Pinkpanther – you can find it on templatesold.com.